It may sound obvious, but if your site isn't prepared and ready or accessible, the concrete barriers will be less effective. We've shared below some common mistakes, and ways to get round them. Have more than a 'rough idea' where you want the concrete barriers. Spending a few minutes measuring can save you wishing you'd put them somewhere else after the lorry has gone. It could also save you having to pay waiting time. Our most common concrete barriers are 2.3 metres and 1 metre long BUT remember to allow slightly more than this if the site isn't 100% flat (which most aren't). Concrete barriers work best on level ground - many customers will have limestone or other aggregate on site to level out the couple of inches difference. 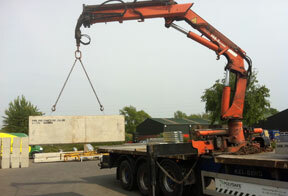 Concrete barriers are big and heavy, they need a big lorry. Seems obvious, but a lorry weighing almost 40 tonnes and 40 foot long needs VERY firm ground - and space! Consider where the lorry can turn and manoeuvre, and if it means going over ground that doesn't belong to you, ensure permission has been given. Also remember the lorry needs space to off-load to the sides and rear - and the crane needs height clearance if the Hiab is used! Our drivers are experienced and capable, but if they could choose ideal conditions, it would be 3 metres clear on the drop-off side, and no obstructions overhead - especially cables! 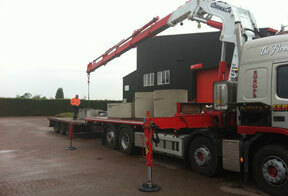 And finally the route to your site needs to be accessible to an HGV size/weight lorry. If you have a difficult to access site, please let us know and we can look at different options (e.g. smaller vehicle or off-load nearby then moving individually with smaller plant). If you haven't done so already, don't forget to have a look at our before ordering page to make sure you get the best deal.